The Historical Areas of Istanbul, situated on a peninsula surrounded by the Sea of Marmara, Bogazici (Bosphorus), and Halic (Golden Horn), were inscribed on the UNESCO World Heritage in 1985. The city, which has been settled by 6500 BC, served as the capital of the Eastern Roman and Ottoman empires. 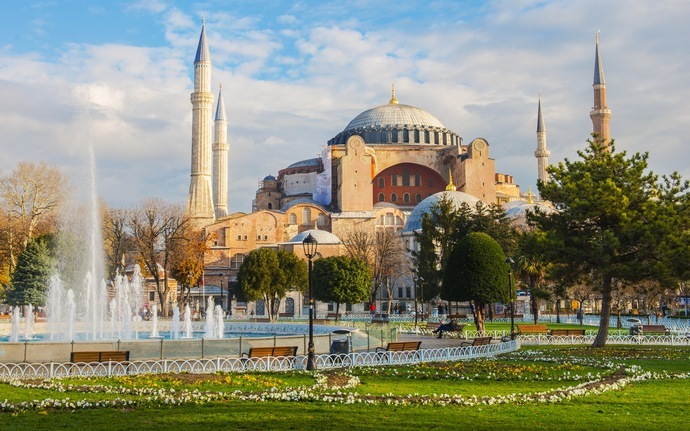 More than 120 emperors and sultans ruled the city for more than 1600 years. Istanbul is a holy city, where mosques, churches and synagogues exists side by side, and even declare their fraternity. Istanbul is the only city situated on two continents in the world. The Historical Areas of Istanbul are represented by four main areas- Sultanahmet Archaeological Park, Süleymaniye Conservation Area, Zeyrek Conservation Area and Land Walls Conservation Area. These areas differ from each other in terms of the periods and characteristics of the cultural properties that they house, and they display the urban history of Istanbul. The creative geniuses of various periods left behind outstanding architectural achievements. Numerous monuments, historical buildings and archaeological ruins uncover the architectural, cultural, artistic and social values of their periods. Sultanahmet Mosque (Blue Mosque): Ayasofya (Hagia Sophia) and the unique mosaics of Ayasofya; Topkapi Palace, the administrative center of the Ottoman Empirel; Süleymaniye Mosque, the masterpiece of imperial architect Mimar Sinan, rising high above the Golden Horn, Yerebatan Sarnici (the Basilica Cistern), the City Walls, the Timber Houses and the music dancing at the domes of Aya Irini (Hagia Eirine) make Istanbul the capital of history and culture. Dolmabahce Palace, Tophane Mosque, Galata Tower (Christea Turrins), built by the Genoese and the historical Kapali Carsi (the Grand Bazaar), which are not included in World Heritage Area, are important cultural properties worth seeing. Ayasoyfa Museum, which is one of the historical areas of Istanbul, was completed in 537 AD. Built as a cathedral, it served as the most important center of Christianity for approximately 1000 years. Following the conquest of Istanbul by the Ottomans, it was converted into a mosque. The building is presently used as a museum. Sultanahmet Mosque, which is right across from Ayasofya, is one of the most magnificent mosques in the city with its domes, side domes, and 6 minarets. The mosque has more than 260 windows and is decorated with more than 20.000 Iznik tiles. Topkapi Palace served as the administrative centre of the Ottoman Empire for 380 years, and today it houses the 86-carat Kasikci (Spoonmaker’s) Diamond, which if recognised internationally. The Palace is, at present, a museum exhibiting unique artefacts from the glorious history of the Ottoman Empire. Yerebatan Sarnici (the Basilica Cistern), which was built in 542 AD in order to provide water to the Great Palace, is situated within the Archaeological Park. According to Greek mythology, Medusa turned to stone anyone who dared to gaze directly at her. The head of Medusa carved at the column- base can be seen in the shallow waters of the cistern, and it is the most visited attraction in the Park. An important part of the historical areas of Istanbul are the hundreds of mansions timber houses, and public buildings in Zeyrek and Süleymaniye Conservation Areas that have managed to survive until today. Istanbul with its history and natural beauty has been a source of inspiration for numerous artists. Countless poems and songs have been written and composed for the city. Istanbul is a city full of history and invites visitors to experience its rich culture and beauty.